Audition are NOW CLOSED and the Principal cast has been announced! Orientation for new chorus members will be held at the start of rehearsals on the 13th June 2017, however, we will continue to accept new chorus up until the 4th of July. If you are interested in joining the chorus, please email us ( info@gsosydney.com.au ) or fill in the Expression of Interest form located at http://www.gsosydney.com.au/newchorus.html with your details and a contact number. Those wishing to join the chorus will need to be evaluated for voice type and singing & stage movement abilities; don't worry if you are very new to this, it is a very casual evaluation and not a formal audition. The evaluation will take place during the 1st rehearsal. The process may be waived at the discretion of the directors if you are known to them from previous shows. To help you learn the music, audio CDs/USBs of all the chorus parts will be available for all cast members from the start of rehearsals. 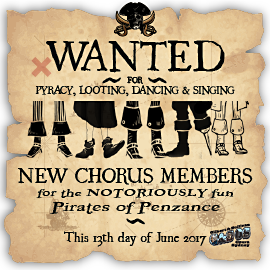 On the right side of this page are 2 documents that you will want to download if you are wanting to join the chorus as a new member: Pirates of Penzance Production Schedule and the Membership Application. Returning Chorus members will need the Production Schedule and to fill in the Membership Application again. If you are on Facebook, 'Like' our page to receive automatic updates via Facebook. Rehearsals are held every Tuesday and Thursday evening at the Parish Hall, St Francis Xavier Church, 17 Mackenzie St, Lavender Bay (North Sydney). The company normally holds closed auditions, this being the preferred choice of the management committee and the directors involved. If you audition for us and are unsuccessful in obtaining one of the principal roles available, we sincerely hope you will audition for us in the future. When selecting a performer for a particular role, we take into account the performer’s ability to fully project all the characteristics required for that role. We assess the musical ability and dramatic interpretation as well as consider the overall balance of vocal types, ages required for the roles, whether couples complement each other, etc. Decisions of the Audition Panel are final and we cannot enter into discussions about our choices. We do urge you to consider accepting a re-call if you were unsuccessful the first time, as some of our most valued performers have joined us this way. Singing in the chorus of one of our G&S productions is a valuable musical experience. Due to our ensemble style of production, our choruses are featured as individuals as well as being part of a group. Gilbert & Sullivan Opera Sydney values the contributions of both principals and chorus as both are vital to the artistic success of a production so, in our company, everyone is “a star”. Promise of the specific skill required for the role. Willingness to work with directors. Amiability, enthusiasm and willingness to learn. Performers with a well-rounded talent. We do not ignore the inexperienced newcomer.